Daniel Ash (guitar), and his friend David J Haskins (bassist), along with Haskins’ little brother, Kevin Haskins (drums) played in various bands during their childhood years. However, most bands wouldn’t last more than one gig. While Ash continued to float from one band to the next, he was continually trying to convince friend Peter Murphy to be in a band with him on the grounds that he felt Murphy had the right ‘look.’ Murphy finally caved, however at first Ash chose against inviting David J into the band, as he wanted the band to be his and under his control. After only a few weeks with Chris Barber as bassist Ash reconsidered and asked David J to join them. Although David J has already committed to touring with another band, he felt playing with friends was top priority and left the other band. The group played their first gig as an unnamed band in Wellingborough on New Year’s Eve 1978. 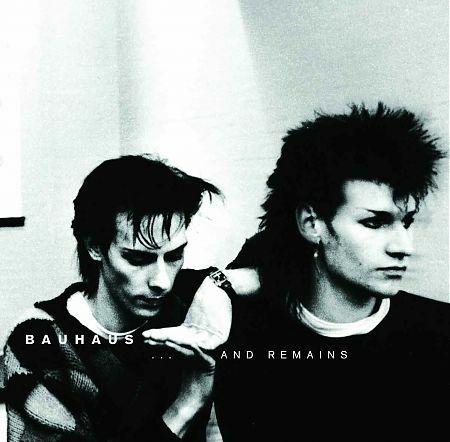 The band eventually chose the name Bauhaus 1919 in reference to the German art movement of the 1920s as they felt the associations of the movement matched their musical style. In hopes of getting a record deal, an associate of the band, Graham Bentley, recorded a gig and sent it off to record labels, however the attempt was unsuccessful, as many record companies at the time did not have home video equipment. With this knowledge Bauhaus decided the record a demo. After only six weeks together the band entered the studio to record their five-song demo. One song, ‘Bela Lugosi’s Dead’ was more than nine minutes long and became their debut single off of Small Wonder Records, during this time the band dropped the 1919, and released the track as just Bauhaus. The song did well, getting play on John Peel’s evening show and getting them an invitation to record a session on Peel’s show on 3 January 1980. The band released three more singles, one being ‘Telegram Sam’ originally by T.Rex before releasing their debut record, In the Flat Fields in 1980 off of 4AD record label. Although the album received negative press it topped the indie charts and peaked at 72 on the British pop charts. Due to Bauhaus’ success they moved to 4AD’s bigger label Beggars Banquet Records to release single ‘Kick in the Eye.’ For their second album, Mask (1981) the band used a variety of different instruments to add a diverse sound and recorded a video for its title track as a promotional tool. Their following single ‘Spirit’ did not do well on the charts. Upset with the results, the band re-recorded it for the third album, The Sky’s Gone Out (1982). During this time Bauhaus recorded a version of David Bowie’s ‘Ziggy Stardust,’ which became their biggest hit and got them onto Top of the Pops. Due to the single the album reached number four on the charts. The attention let to the band’s appearance in horror film The Hunger, where they performed ‘Bela Lugosi’s Dead’ during the opening credits. Before going into the studio to record their fourth studio record, Burning From the Inside (1983), singer Peter Murphy was taken ill with pneumonia. Not wanting to wait on Murphy, Ash and David J took over the project even doing lead vocals on a few tracks. The album faired well, it’s single, ‘She’s in Parties,’ going to number 26 on the charts. The band embarked on an international tour in support of the album, however one night before a gig at the Hammersmith Palais in London Bauhaus decided to split. The band told the fans to make sure to make it out to the show, not tell anyone that this would be their last. After a set and long encore that included many earlier songs, David J said ‘rest in peace’ as he walked off stage. Burning was released a week later to positive reviews and the band released a limited edition single ‘Sanity Assassin’ as a thank you to all the fans in their fanclub. After the break-up all members embarked on various projects. While speaking of their respected projects at the time, David J and Ash decided to try to reform Bauhaus. The four members decided to meet up and practice, however Murphy never showed, but the three enthused by the chemistry between the them formed Love and Rockets in 1985 that did well with single ‘So Alive’ in the US, but never made much of an impact in the UK. In 1999 after seven albums the band called it quits. In 1998, Bauhaus decided to go on a ‘Resurrection Tour’ that included a new track ‘The Dog’s Vapour’ which was included in the soundtrack for film, Heavy Metal 2000. A live album, Gotham (1999) was released following the tour. track ‘Bela Lugosi’s Dead.’ The band then embarked on a tour with Nine Inch Nails where they alluded that they hoped to record new music. On tour together until 2006, the band recorded and then released their fifth record, Go Away White in 2008. However, it marked the end of the band as there was no supporting tour and later members referenced an ‘incident’ that was never explained, but clearly led to the end of Bauhaus.